Warning to readers: Photos of toilets appear in this post. 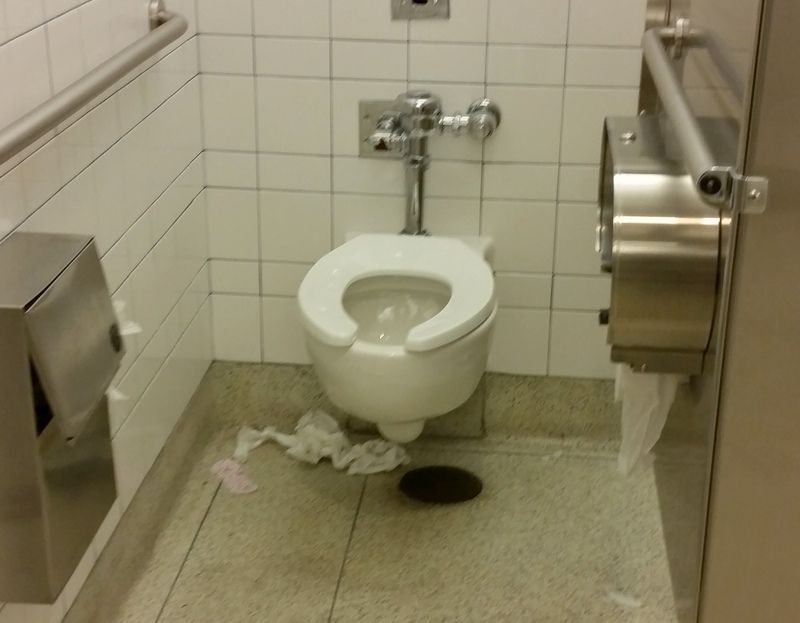 Kisha Burgos stopped at the bathroom in the baggage claim area and was shocked to see paper-strewn floors, filthy toilets and empty and broken paper dispensers in the stalls. “It’s bad,” she told me comparing it to the airports she visited in Bangkok, Vietnam and Laos on her recent five week trip. “Everything was really clean,” she said of the bathrooms in places one might not expect to find them. In the airport of one of the world’s great cities by contrast, more than half of the auto flush toilets were not flushed and otherwise unclean in the bathrooms maintained by American Airlines. In the pre-immigration hall last night only 4 stalls were serviceable which was an improvement - if only a slight one from the condition one week earlier when not a single stall was usable. In an email, American Airlines spokesman Casey Norton blamed weather problems for the first instance of terrible toilets, those I discovered on January 10th. For sure, it was not a good night to be flying into JFK. Several arriving flights were late and landing at the same time. This meant “more customers using the facilities than what is anticipated under normal circumstances,” Norton said. According to Anthony Bucci, a spokesman for U. S. Customs and Border Protection, nine flights came in at the same time; between 5:00 and 6:00 that evening. I returned on AA flight 398 from St. Maarten and congestion in the arrival hall as was so bad, people were unable to step off the escalators - the room was that jam-packed. “Sixteen hundred passengers arrived,” Bucci told me of a scene that could only be described as madness. Still the third-world bathroom conditions weren’t a one-off as I learned last night when I was back again in Terminal 8. The cavernous hall was nearly empty with just Finnair passengers present. So I paid another visit to both arrivals bathrooms. In the immigration hall, some toilets were functional but now water leaked from one stall, pooling in the center of the floor. In the restroom by baggage claim a visitor from Finland told me the bathroom was the worst she'd seen in her frequent travels in the west. Wanda Rivera, who works for LATAM was using the mirror to put on her makeup. “To me it’s bad,” she said. Elizabeth Perry, another airport worker said she pops her head into stall after stall just to find one clean enough to use. “Everytime, its eww, eww, eww,” she told me adding that the custodian has a tough job. Airport workers know the secret is to use the toilets on the departure level because passengers are better cared for there. 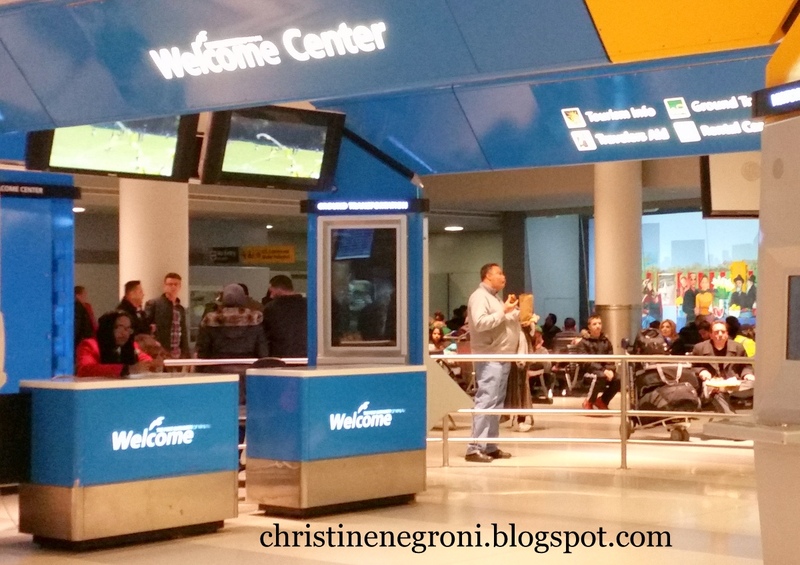 Keeping them happy encourages them to shop and dine while waiting to board their flights. Arriving passengers on the other hand, are in a hurry and on their way out. The most customer-friendly airport is Singapore’s Changi where every bathroom has a touch screen survey enabling users to immediately register their satisfaction. But even without such sophisticated technology airport bathrooms on practically every continent - in both modern and developing nations - are in better shape than the two I visited at American’s Terminal 8 these past two Sundays. “We are reviewing the matter with the company that cleans the facilities to make sure customers have a better travel experience in the future,” American's Norton told me. Within sight of the bathroom where I was chatting with Kisha Burgos, a large illuminated kiosk greets visitors to New York. A more useful and more sincere welcome would be to meet the basic needs of air travelers on both sides of their flight. That's a message for American Airlines and oneworld that's true around the world.